If you would love to experience an amazing food and wine oriented tour of Tuscany, Italy without having to call the wineries and manage the reservations, transportation, and accommodation arrangements, Euro Travel Coach has a perfect opportunity for you! Greg and I have led tours through Europe for over 20 years. We loved every bit of it, but it was always connected to the university where we taught, so it wasn’t 100% our own.. Now, Euro Travel Coach gets to create our tours and focus on what we love — food, wine and culture. Whereas the heart of our business is custom trip planning, our passion extends to wanting to take care of people while traveling to some of the most exciting destinations in Europe. ETC led our first escorted small group tour of Tuscany last spring. It was such a success that we have offered 2 more Tuscany wine and food tours in 2019. Just look at the reviews from the people who traveled with us! We had a blast! The tour in March is fully booked but you can still join us in May! We have another incredible itinerary planned to one of our favorite places in Italy: the Val d’Orcia in Tuscany. We love it because of the food, the wine, the history, the hill-towns, the countryside, the culture, and the people. Wouldn’t you like to join us? Our original business plan was to have a completely online company that we could run from anywhere. But as we moved closer to our vagabond adventure we realized that we also want to travel WITH our clients in addition to planning travel FOR our clientele. We love planning itineraries and making arrangements but we also enjoy sharing those experiences with others. Both Chelsea and I have degrees in hospitality and of course Greg’s career in music is based on entertainment -- so you really DO want to travel with us! We will take great care of you! We are so excited about this itinerary. We have secured a beautiful villa just outside of Montepulciano, Italy, with the nicest Italian owners you could ever meet. We have a 7 day tour planned for a maximum of 10 guests. Having small group tours allows us to really take care of each person and make the experience truly special. I encourage you to review our “tours” link and review our Small Group Tours of Tuscany to see all the details of the tour. Then drop me an email and ask me questions! I would love to talk about Italy with you! We really hope you will travel with us to Tuscany! We've had great response so far and several spots on this tour have already been reserved. We are excited to fill up our Tuscany wine and food tour in May and work on more tours in Italy and elsewhere in Europe. Our 2nd location for a small group tour is in Piedmont, Italy in the fall of 2019, during truffle season. We still have openings on this wine and food focused tour of Piedmont during the second week. After that we look forward to planning small group tours to Sicily, the Mosel Valley in Germany, to Provence, France, and maybe even to Belgium for a beer tour! We could also do a golf trip to Scotland or Ireland — we can go anywhere! 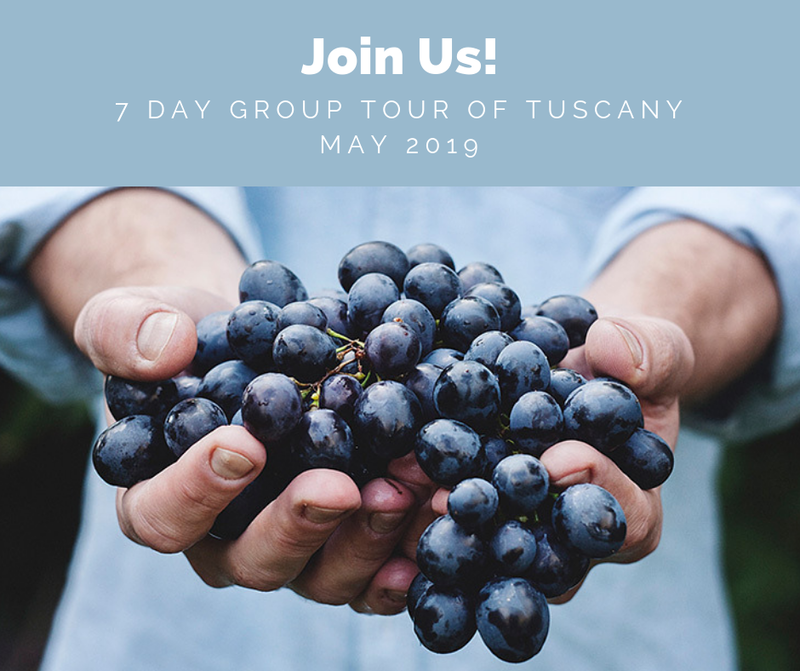 If you missed our tour of Tuscany in 2018 or in March, join us on this small group tour to Tuscany in May 2019. Contact Euro Travel Coach about our Tuscany Tour! Let me know what you think of Euro Travel Coach’s trips and reserve your place soon as spots are limited! Also remember that we are always available to you and your friends and family for custom trip planning in all of Europe. We create fantastic, fully custom Europe itineraries. We would love to make one for you and your family and friends! You can reach me at betsy@eurotravelcoach.com. I would love to help you make your travel dreams to Europe come true! Please Sign Up with your email address so that we can let you know every time there is a new blog post. Thank you so much for signing up to receive the Euro Travel Coach blog!